A charming pair of restored trulli immersed in the beautiful Valle d'Itria. Cosy and characterful, you might just want to take Ai Trulli home with you after spending a week or two there! But it's not just the houses that have such winning qualities: the lovely gardens and pool are charming too... All within a stone's throw of several of Puglia's loveliest towns! Inside: accommodation at Ai Trulli is spread over two trulli buildings. The larger of the two is neatly divided into living and sleeping areas. Access is into the light living area, which features traditional creamy stone walls, a high conical ceiling and fireplace. To the left of the living area, through an arch, is the well-equipped kitchen, while to the right, through another arch, is the cosy dining area. Continuing further on, one comes to a small sitting area, with sofa and desk, which leads to the sleeping quarters: a double bedroom with en-suite shower room and the master bedroom also with en-suite shower room. The master bedroom is accessed either via the first bedroom or from the garden. 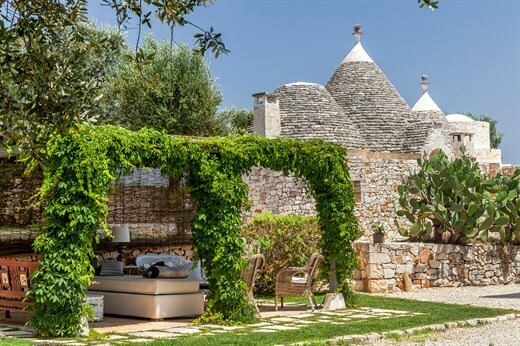 The second, smaller trullo, has a similar layout to the first, with the living room in the centre, a small kitchen through an arch to the left and the sleeping quarters - a double bedroom and a bathroom with shower - to the right. The fourth and final bedroom, also a double, is attached to this second trullo but only accessed from the outside. This too has its own en-suite shower room with separate WC. While there are four bedrooms in total, the maximum occupancy is for six guests and the fourth bedroom is available on request for an extra supplement. In both trulli, the original features and stone structures have been kept intact as much as possible and furnishing and fittings complement these aspects with cheerful rusti-chic panache. Outside: Ai Trulli is set amongst a series of well-tended lawns, dotted with olive trees and criss-crossed by dry-stone walls and gravel paths, one of which takes you down to the lovely pool, situated just below the houses and offering views over the gentle surrounding countryside. Closer to the house are a series of sitting areas and an al fresco dining area for those long summer dinners! While there are four bedrooms in total, the maximum occupancy is for six guests. The fourth bedroom is available on request for an extra supplement of € 800. The two houses are never let separately, so you will always have exclusive use of the grounds and pool. The smaller one has only a basic kitchen and guests normally cook and dine together in the larger house. Due to the rather uneven track leading to the house, we recommend clients rent a 4x4 or at least a car with a high ground clearance. Ai Trulli is set in the heart of the Valle d'Itria, a few minutes' drive outside the charming town of Cisternino. The geography and views in and of this area are what many consider to be the "typical" Puglia. Rolling hills, groves of centuries-old olive trees, trullo cones everywhere you look, whitewashed towns bleached further by the southern Italian sun. But Ai Trulli is close to the beach too: a drive of about 20 minutes will take you to a long sandy beaches of the Adriatic coast, where you can either pitch up where you find a space, or check in at one of the stylish lidos on the coast. Towns not to miss in the vicinity include Ostuni, the whitest of all the whitewashed towns nearby, Locorotondo (literally the round place) and Alberobello (where you will see enough trulli to last a lifetime). "Ai Trulli was obviously fantastic: beautifully designed, great location, very nice facilities, superb swimming pool." Ai Trulli is incredibly beautiful and well maintained. Everything about it was incredible. The caretaker was lovely and she cooked us one of our best meals in Italy. We thought that Ai Trulli was amazing and the housekeeper who welcomed us was brilliant. Ai Trulli was a fantastic place... Great accommodation. Ai Trulli was obviously fantastic: beautifully designed, great location, very nice facilities, superb swimming pool. We didn't leave the villa because it was so nice! We had a wonderful time and the staff on ground and in London were most helpful. Our holiday was absolutely perfect. The Thinking Traveller is the best villa agency we ever used. Your attention to detail etc. is second to none. Everything was excellent... We loved it all! Ai Trulli was filled with charm. Really ticked lots of boxes for us, so was great. It was an unforgettable holiday - totally lived up to my high expectations... Wine delivery very useful, in villa cook, Teresa was great - we had a superbly cooked meal and a fantastic evening. One of the best holidays we have ever had. Very sad to leave.